When it comes to the starter motor, Lucas TVS starter motor stands first in the list. Apart from two-wheeler and cars, the starter motor device is used for stop-start function in most industrial plants. However, there are so many interesting things to know about the starter motor. It is interesting to know about the starter motor which you use every day, but do not know how it functions and when it started. The starter motor is a kind of device which is capable of turning the internal combustion engine to run repeatedly until the ignition starts. Once the engine starts running under its own power, the starter motor separates itself from the engine. When was Starter Motor Invented? You may have seen how a lawnmower machine starts, right? The same method was applied over a century back (before 1912) to ignite a vehicle. Earlier, a starter motor was human-powered and the driver would use a crank to start vehicles. To start the engine, the crank inserted into the space given into the front of the engine. The driver needed to spin the handle and remove it when the engine got started. The same process continued till 1912 when Cadillac invented electric starter motor. Gradually, by 1920 most of the cars and other machines adopted electric starter. Earlier till 1960, Bendix drive starter was very popular in the market. Then after most of the machine and vehicle companies began manufacturing their own starter motor. Lucas TVS starter motor is one of the best companies, providing a range of starter motors for Two wheelers, Direct drive and starter based stop-start solution. Lucas TVS not only provides starter motors but also offers a complete system solution in Auto electricals, Ignition products, Engine cooling modules, specialized motors, etc. What Features do Lucas TVS Starter Motor Provide? Lucas starter motor provides a range of features based on the type of vehicles. For example, for two-wheeler engines, the company provides starter motors, which have light-weight; provide integral and separate drive assembly options; feature high corrosion resistance and work with both dry clutch & wet clutch applications. For Direct Drive Vehicle: Direct drive vehicles include passenger cars as well as commercial vehicles and Lucas TVS starter motor suits every type of car and vehicle out in the market. The latest starter motor made of robust design for longer life while it is not affected by water and oil ingress. Apart from that, the starter motor works with gear reduction starter and also provides a stop-start solution. The motors have been designed, keeping all safety and optional features in mind. 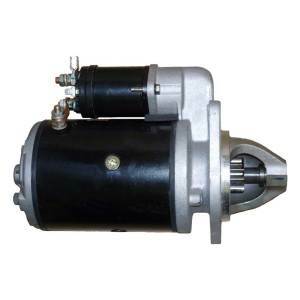 In short, Lucas TVS offers quality starter motor which gives satisfactory result and comes-enabled with ample features. This entry was posted in Lucas TVS Starter and tagged Lucas TVS Starter, TVS Starter Motor on June 9, 2018 by dtsdev.